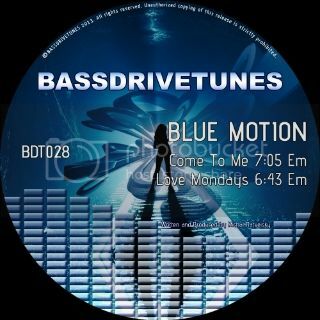 Bassdrive • View topic - [BDT028] Blue Motion - Come To Me/Love Mondays OUT NOW!!! [BDT028] Blue Motion - Come To Me/Love Mondays OUT NOW!!! BassdriveTunes is pleased to announce the release of two eagerly-awaited tracks from Slovakia's Blue Motion. [BDT028] consists of two excellent examples of Blue Motion's diverse production style - the dancefloor-driven "Come To Me" as well as the luscious and appealing "Love Mondays". [BDT028] Blue Motion - Come To Me/Love Mondays is OUT NOW and available at all your favorite digital music stores! Check them out!!! and support one of the most dynamic artist in Drum&Bass! Since forming Blue Motion in 2009, Slovakia’s Dirrrty B has set out across the airwaves, unleashing a relentless amount of deep and soul-moving musical allure to the masses. Lashing out like an unexpected storm, Blue Motion has left its imprint on many well known labels, including Fokuz, Phunkfiction, Spearhead, Good Looking, Blu Saphir, Citrus, Telluric, Peer Pressure, Point 9 Audio, Temper D Productions, Future Thinkin, and Influenza Media, and has collaborated with the likes of Sconeboy, The Square, Atmospherix, Brandon Miles, Paul SG, Mutt, Stanza, Wreckage Machinery, and SoulTec. Vocalists Grimm and MC Fava have also been heard as their vocal stylings creep through the depths of this emotional sound mosaic. Re: [BDT028] Blue Motion - Come To Me/Love Mondays OUT NOW! !